CCI Ammunition is one of the most well-known producers of aluminum-cased cartridges, having popularized this style with their "Blazer" line of ammunition. 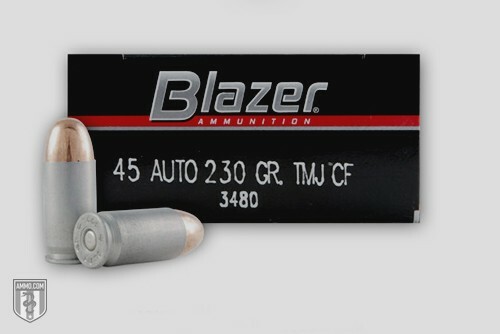 However, if you are looking for aluminum-cased ammo in 9mm, .40 S&W or .45 ACP, Blazer is hard to beat. The difference between brass vs. aluminum is a common question. One big reason that aluminum bullets are gaining fans among the shooting public is cost savings. The price of brass fluctuates based on the current price of copper, and during certain times it can be relatively expensive to mass produce brass-cased ammunition. There's an easy solution found in aluminum, due to more stability in price that is considerably less than brass. An interesting side note is that this metal is also tough enough for use in aircraft while being remarkably light (about 1/3 the weight of brass). Aluminum-cased ammo has had its proponents and detractors since its introduction in the early 1980s, but demand continues among those who want a cheap alternative to brass-cased ammunition. Today, only two major manufacturers are producing aluminum-cased ammo – Federal (with Federal aluminum 9mm among its most popular) and CCI. Although not in huge demand for small arms ammunition, aluminum ammo is the standard for tank and auto cannon shells, such as the 120mm aluminum rounds used in the Abrams tank and the 30mm ammo used in the GAU-8 – most commonly found in the A-10 Warthog. When it comes to aluminum casings, you won't find a lighter cartridge. These cartridges are as light as you can get, without sacrificing the integrity of the casing. You can feel quite a difference if you're purchasing in bulk, and you hold a box of aluminum in one hand and a box of brass in the other. Although not a huge difference for the casual shooter on the range, it is most noticeable when being carried in a larger quantity for a longer period of time, such as in military or police applications. A box of aluminum-cased cartridges will typically cost you less than a box of brass-cased cartridges. If you only buy one box a couple times a year, you may not care about the difference too much. But if you enjoy shooting at the range, plinking on your property or hunting, this will add up. For the best savings, buying by the case will typically give you the best deal. You'll find reloading debates on firearms and ammunition forums, but the official stance is just don't do it. Though it is very strong, aluminum does have a lower melting point than brass or steel and the structural integrity of the casing simply isn't guaranteed to hold up successfully through one or more reloads. Also, the decreased flexibility of the aluminum case when compared to brass makes the resizing of the case length, and the opening and closing of the neck, a more difficult process. This is due to the increased likelihood of cracked case necks and shoulder separation – both potential disasters waiting to happen. For the common shooter, recycling aluminum cases is the best option. This won't be an issue for most people, but it is an interesting fact. When used in automatic weapons that are specifically manufactured for steel and brass, aluminum casings could melt or otherwise become unstable. Odds are you aren't hunting moose with an M-60 or MAC-10, so this is more or less a "non-issue" for most target shooters or for those training to use a new firearm. Cartridges with an aluminum casing are a great choice for people who have no interest in reloading their spent brass casings. The aluminum cases also provide an excellent choice for long-term storage ammo, as they are extremely corrosion-resistant. Finally, the competitive price makes aluminum-cased ammo a great choice for casual shooting.